If you are not a golf fan, this post may or may not be all that exciting for you. 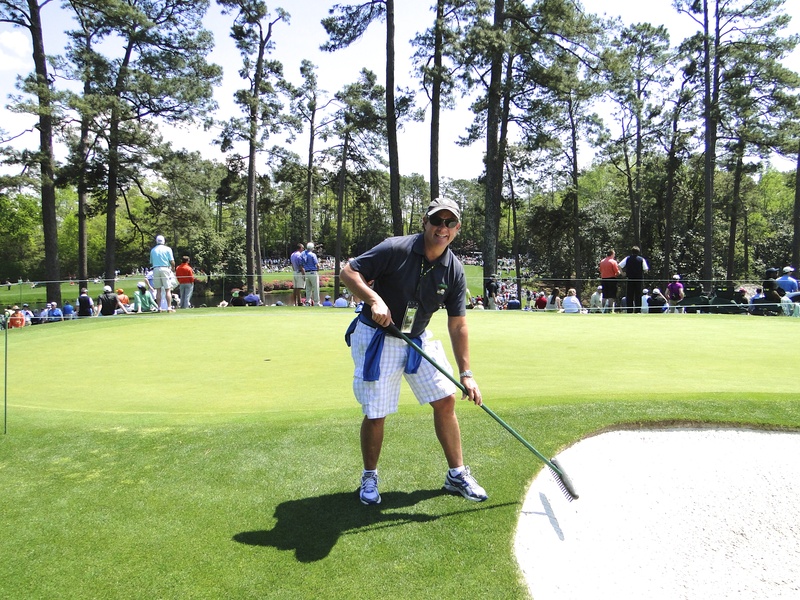 But, for the golf fans out there, I will do my best to give you as much as you can handle describing Augusta National and our trip to the Masters Golf Tournament. Traci and I left Columbia, SC and headed to Augusta, just a short 90-minute drive SW down Hwy 20 into Georgia. We arrived at the Heritage RV Park, about 10 minutes west of town, and the owner Don was there to guide us to our site. 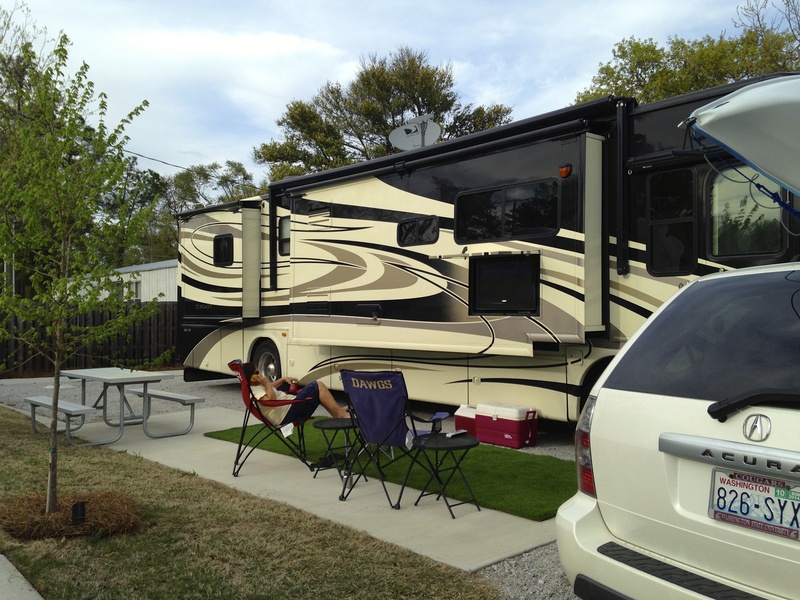 We had made reservations with him back in September, as there are very few places to park your RV in or around Augusta. This former mobile home park is being completely renovated and turned into an RV park, and there were lots of areas that had been updated, and others they are working towards getting completed. Don and his staff were working hard to get the park looking good for their busiest time of the year, Masters Week as the locals refer to it. (This whole area had suffered a major hit from an ice storm about 6 weeks prior and many places were still trying to repair the damage to trees.) The site we stayed in was perfect, great satellite reception, a very nice little concrete patio outside, and quiet. After getting set up, Don came by on his evening rounds and sat down and visited with us for what must have been two hours, what a really nice man, can’t say enough great things about him and the park. When we left Columbia, we hurriedly made a “Need 2 Masters Tickets” sign, hoping to display it in the back of the car for the drive, only to find out it was too big to fit anywhere. We decided to place it in the windshield of the MoHo when we arrived, so that anyone arriving in the park would know we were looking for extra tickets. (We actually got a few ticket offers from the sign, surprisingly.) We had been watching the ticket broker sites for quite some time, and really understood the market, but the prices were just way up there, and basically unreasonable for what was being offered. (A huge thanks to Tiger for not coming, dropped prices by at least 20% immediately, and probably another 25-40% over the week.) The tickets are one of sports most difficult to get, you have to know someone, of someone, of someone, to get one from the Masters directly, or take a chance with a broker or street scalper. We had our work cut out for us, and it was a bit stressful at times not knowing what we were going to have to spend to get in. We woke Tuesday to cool but clear skies, and the excitement was starting to build, but Traci and I still needed to find tickets. The practice round tickets were much more reasonable and we had contacted several brokers, but it was still a bitter pill to swallow, so we held out. We did venture to the course and waited around outside to see if anyone leaving would give us a pass to go back in later in the day (along with about 150 other people) to no avail. Bummed that we could not get in, we headed to Hooters for a beer and to wait for a call (no cell phones allowed in the grounds at the Augusta National) from the group to meet up for dinner. John Daly, a great golfer who was not in the tournament this year, and who is sponsored by Hooters, had his motorhome parked just outside selling his merchandise and posing for pictures for those who purchased his wares. We headed out for dinner that night, to my new favorite, Carolina Ale House (see one of our previous posts about the wings here!) and waited for Matt and Nicole to arrive after a day of golfing themselves. 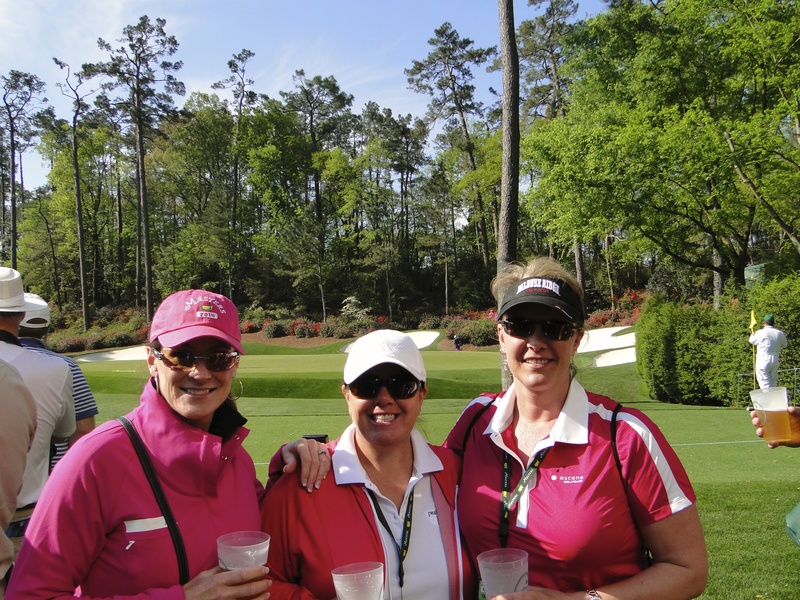 Nicole, Traci & Sunny in front of the 13th green – the pink ladies! Wednesday was here, the final practice round and the famous Par-3 contest. (During our ticketing search, I had placed an advertisement needing tickets on Craigslist, and we were super lucky to get a reply from a very wonderful lady from Coeur d’Alene, ID who was flying in with her son and had an extra she was willing to sell to us for a great price, thanks Susie!) Eventually we had all secured a ticket for Wednesday, and in we went around 8:45AM. The Masters welcoming committee was in full force. We heard “welcome to the Masters” over and over from the staff and everyone was so friendly. We grabbed a couple of beers and headed out to the course, and on the first hole we came to one of Traci’s all time favorite players, Sergio Garcia right there finishing up on the 13th green, and about to tee off on #14. As we wandered around, everything we had heard about was true. Not a blade of grass out of place, no weeds, fairways that looked and felt like carpet, greens that were so fast you could not believe anyone could actually get a putt or approach to stop, etc. It was amazing how the place lived up to its billing, and even surpassed our expectations in beauty. We were also lucky that due to the cold winter everywhere, the Azaleas and Dogwoods were just starting to bloom; some years they have already finished blooming, but not so for us. We took tons of pictures, many of the golfers themselves and their groups. (Only during the practice rounds are you allowed to bring in a camera, so we took some 400 pictures that day, wishing we would have taken more – see below for link to more pics.) As the day wore on we finally ended up at the Par-3 course and tournament, a huge draw due to the closeness of the patrons and the participants. This is a “fun” event, with many of the player’s kids acting as their caddies, or some celebrities taking the bag for the participants. This was also the time that the big three had a chance to still knock it around a little; Arnold Palmer, Gary Player, and Jack Nicklaus. We watched this group, along with about 15,000 others, for a hole and they were entertaining as always. 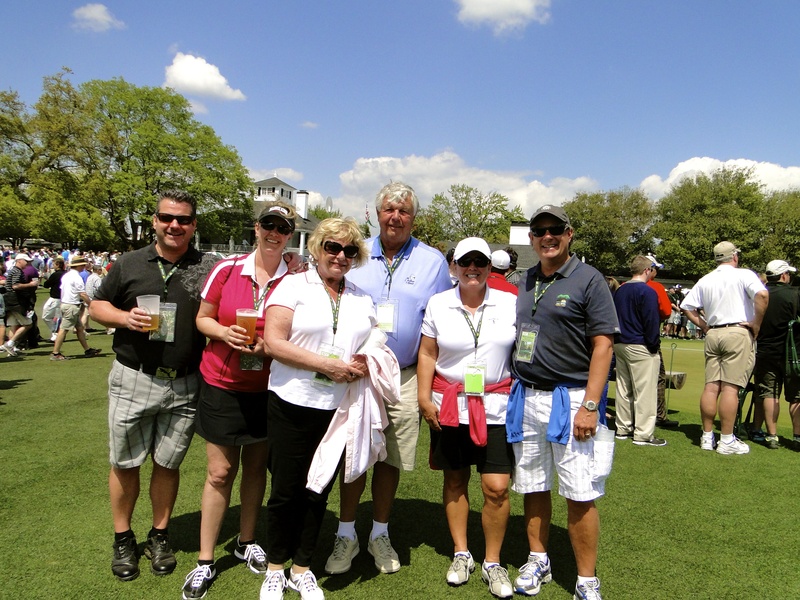 We left the course that evening, and met another group of friends for dinner after securing our tickets for Thursday’s round, all very tired from the days’ excitement of actually walking the hallowed grounds of Augusta National Golf Club! Tomorrow was the Tournament and we had tickets and were going, this was really finally happening!!! As we mentioned above, Sunny, Mitch, Ann and Jerry had four tickets for the week. As luck would have it for Traci and I, there were some days that not everyone in their group would attend, so they graciously offered those extra tickets to us. We so appreciate their generosity and a huge thank you to these amazing lifelong friends whom we consider family! And, we got to spend a week with them, and take in the tournament with friends, icing on the cake! Thursday morning Traci and I got up early and got to the course by 7:45AM, to meet Matt and Nicole and set our chairs for the day. 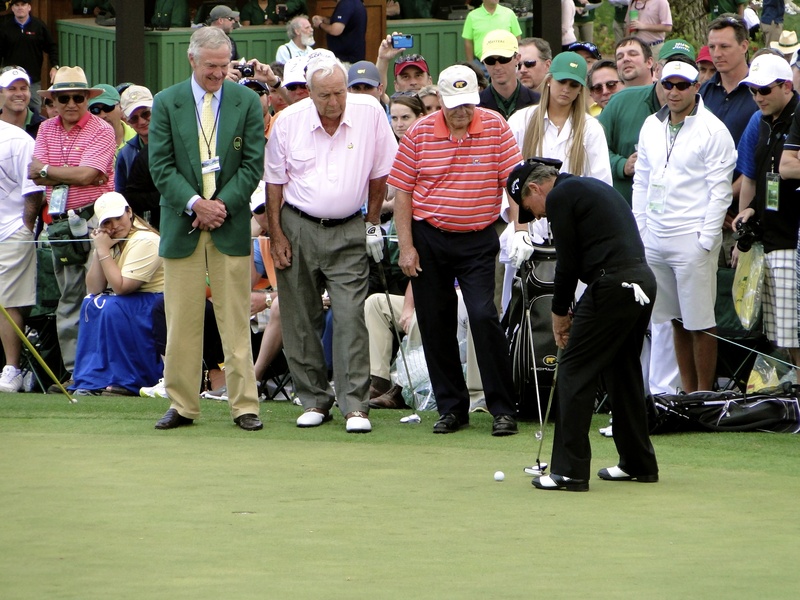 (When you go to Augusta, there are a few decent places to view from grandstands, but most of the “patrons” bring in collapsible chairs, without armrests, and sit at their favorite locations to watch the golfers coming by.) After scouting out the course the day before, we thought it would be fun to try for Amen Corner, an area that is probably the most recognizable 3-hole stretch in all of golf. I figured Thursday being the start of the tournament would be the quietest day here; we scurried down to the 12th hole and set up just 5 rows off the tee box! We could look back over the tee box to #11 green, and see the #13th tee box along with #12 green as well. The #12th hole is the hole that every Masters golf fan knows well, and is said to be the most photographed golf hole in the world, and here we were just 5 rows up, wow! We set our chairs down, and headed out to the course to find some golfers on the early holes. (When you place your chair, it stays there, nobody takes it, or moves it, it is your spot for the day. An unwritten rule that all patrons follow.) 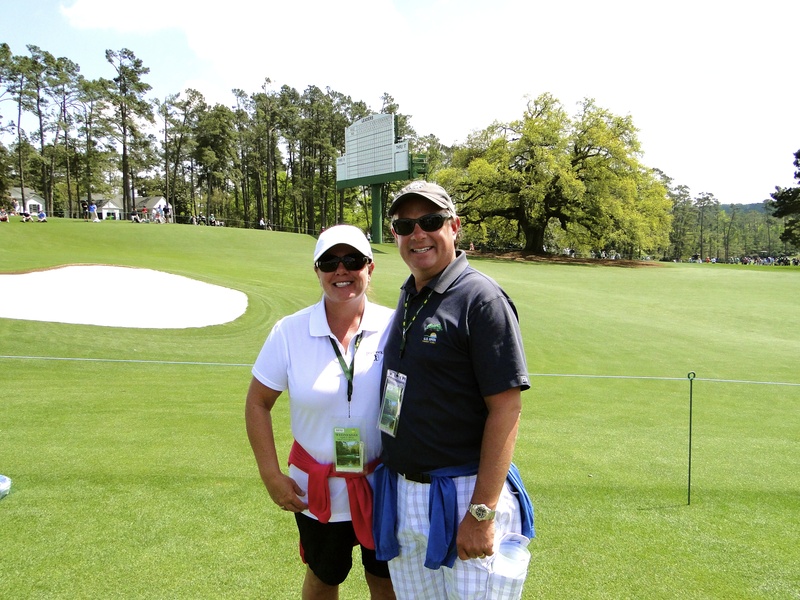 We ventured around and watched from several different vantage points, walking UP and DOWN the hills of Augusta National. If you have watched the Masters on TV, you have probably heard the commentary of how hilly this place is, and it is no joke. Every hole has some sort of slope, and there is not a flat lie for the golfers out there. You really have too see it in person to understand just how hilly the course is, making it that much more of a challenge to hit a crisp shot with your feet at all sorts of angles at impact. We returned to our chairs on #12 tee box around 1:30PM, right were we had left them some 5 hours before. Upon arrival, we found one of our chairs was broken; someone had used it while we were away and it was not repairable. (We had bought chairs prior to coming, but in hindsight, we should have just bought the chairs there, they are only $30 and worth it for ease, quality, and you get to keep the souvenir.) I ran up to one of the on-course merchandise stands, and they had one for sale, issue solved, that other hunk of junk was going back to where we bought it. We sat there for the next 4-5 hours, watching all the groups come through, in the heat of the day, staying well hydrated. This area was so busy and fortunately there was a concession stand and restroom facility just behind the grandstand so no issue with getting anything we needed throughout the day. 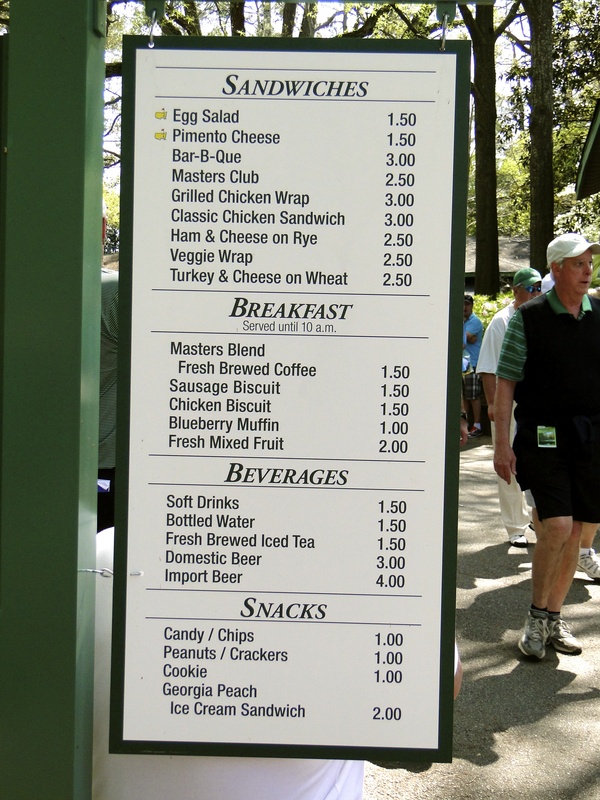 Every concession stand and restroom was busy almost all the time, but Augusta National has created what everyone would call the most well oiled machine ever. No matter how long a line might have looked, concessions, restroom or merchandise sales, it moved incredibly fast, and what would take 30 minutes or more at any other venue, was completed in just 5 minutes, simply amazing. We finally headed out that afternoon after the last group came through and felt like we had done the unthinkable, spent a better part of a day at the most famous golf hole in the world! A side note about the restrooms: They do not use port-a-potties, but rather nice tiled, spacious restroom buildings all staffed with 4 or 5 employees (some of them took their job in stride and had a great running commentary as you entered.) directing “traffic” and making sure they were stocked and clean. The men’s line was always much longer than women’s; something that Traci loved! This is the menu – check out the reasonable prices! Friday brought the second round, and Traci and I arrived early again. We decided that this day would be fun to set up on #18 green, and watch many of our favorites finish their round. We hurried in and set up about 15 rows from the green, with a very good view of the hole. Again we left our chairs and headed out to the course to take in some different views of the course and golfers. 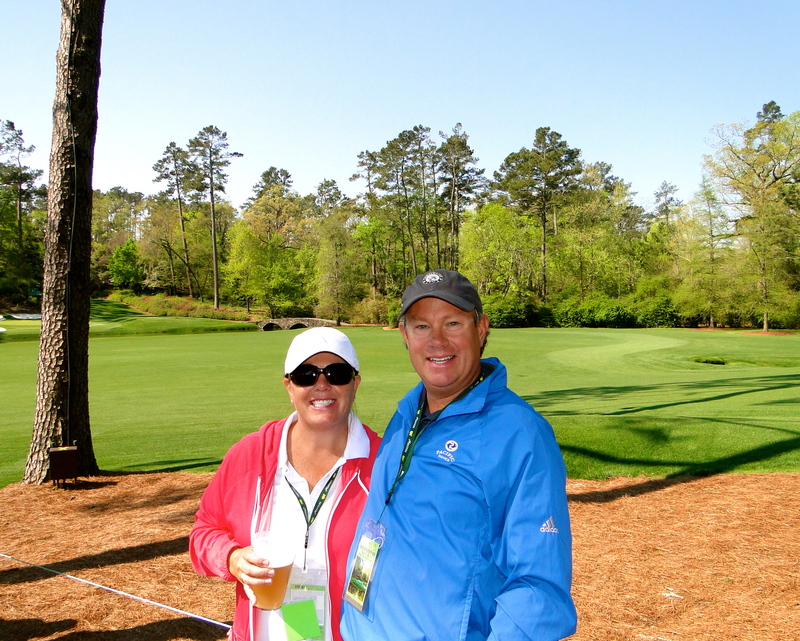 We spent a lot of time in the corner of #1 green, #2 tee box, #8 green and #9 tee box. Some good views, a concession area that was somewhat hidden, and just a nice place to take it all in. We also did some shopping. There are two main buildings for buying souvenirs, with one huge one at the main gate 6, and a second smaller one near the gate 9 entrance. One of the great things is they have figured it out again, that many people here are from out of town, and buying a lot of stuff for friends and family. (We met one guy buying for all his men’s club friends at Harbor Point in Mukilteo!) After you are done buying all your stuff, you can ship it home directly from the course and not have to deal with it, or you can check it like a coat check, and pick it up on your way out, very convenient. We returned to #18 green for the afternoon and were there sitting right off the place that so many greats have won a Green Jacket, again this is a moment soon not to be forgotten! Unfortunately a few of our favorites missed the cut, so we would not be seeing them on the weekend (Phil, Serg and Ernie to name a few). Throughout the week, we were able to see certain views that we wanted to try and return to, and asked many of the volunteers and security about timing for access to the right seat set up locations. So, Saturday we got to the course at 7:00AM, knowing the gates did not open till 8:00AM, but as they say only the early bird gets the worm. At precisely 8:00AM, the course opened and it was a mad rush of speed walkers (no running allowed!) to get to the prime seating locations. We had decided the day before to go for a view of the #16 green, with look-in views of both the #15 green and the #6 green. Many others had the same idea, and it was quite busy. Everyone around us had a plan, and the front rows filled immediately. Fortunately, we had decided to go for the back row, up against a walkway used for patrons to move between the holes. We had learned from the day before that this walkway was to remain open at all times, no stopping and standing. We set up our chairs with the perfect angle to see everything we had scouted out the day prior. Within 10 minutes, the entire area, designated as a seating only section, was completely filled and the guards were standing by to make sure nobody else tried to reshuffle seats to get one more chair in. (It was amazing how few patrons did try to squirm their way in, if the seating only areas were full, they understood and had to go elsewhere – another unwritten rule.) Seeing’s how it was only 8:15AM, and the first tee time for the day was 10:15AM we headed to the concession stand for a snack and did a little more shopping, why not? As the golf began, we followed a few golfers around, and made it to some of our favorite viewing sites, along the fairway of hole #2, and behind hole #7. We returned to our seats about 2:00PM or so, just in time to see the first group arrive, and proceeded to stay there for the next 5 hours and watched every group come through. I think this was our best day at the tournament. We were situated perfectly and could really see a lot, and take it all in without having to move a great deal. We finally left that evening about 6:30PM, two tired patrons, but oh-so happy! Sunday arrived and because we had gone in so early the day before, we slept in an extra 30 minutes, and got to the course about 7:40AM. We hustled to gate 6, the main gate with the intension of setting our chairs at #18 green, along with the rest of the world. By the time we got there, the place was packed, and we had to settle for an area a bit just below the #18 green. I had figured if we were going to do this once, we had to be at #18 green on the last day of the tournament, right? Again, chairs set up, and about 2 hours to kill, so we headed in for our last shopping trip, some breakfast snacks, and wandered back down to #2 green. I think this was our second favorite viewing sight, a small hill off the left side of the green, you could see many of the approach shots down the hill, and we had a good look at the green and all the putting. We stayed down there for about 8-9 groups, and then moved around to later holes, only to hear that Seattle’s own Fred Couples was making a charge early. We followed him for 5-6 holes and the excitement was building, shot by shot. By this time, the course was alive with cheers and roars heard from all over, “who did what on which hole,” everyone was excited! Eventually we returned back to #18 green by 4:00PM as many of the final groups were starting to finish. #18 green was still somewhat quiet, but by the time the last 5-6 groups were arriving, it was packed, so much that we could not see through the heads in front of us and our view was not very good. (Sleeping that last 30 minutes might have hurt us.) We stayed to the end, and watched Bubba Watson win his second Green Jacket, and then walked all the way back down the course to our exit point at gate 9. I was giddy all week, and still am shocked that we got to partake in all of this, 5 straight days at the Masters, one huge bucket list item checked off! And it was so special to be able to spend time and share this experience with our good friends. 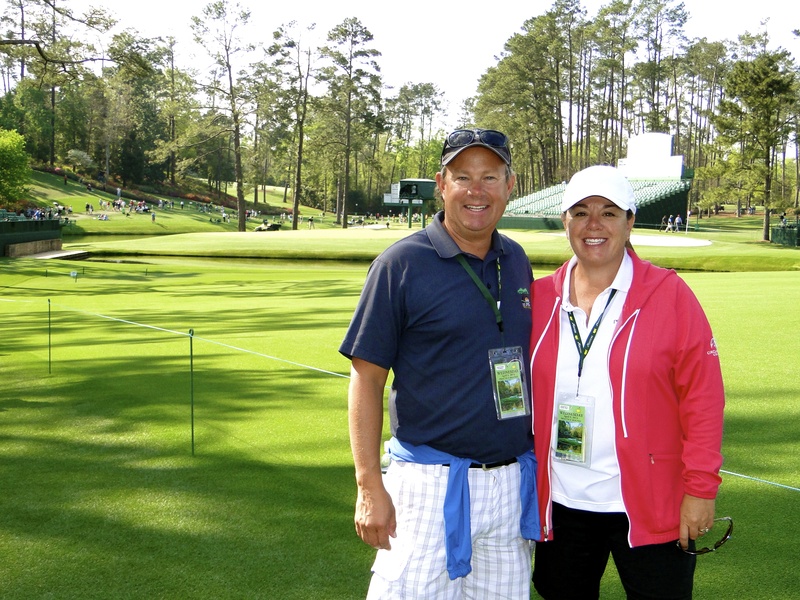 Stay tuned for a follow-up post about tips for attending The Masters. It is now posted HERE! 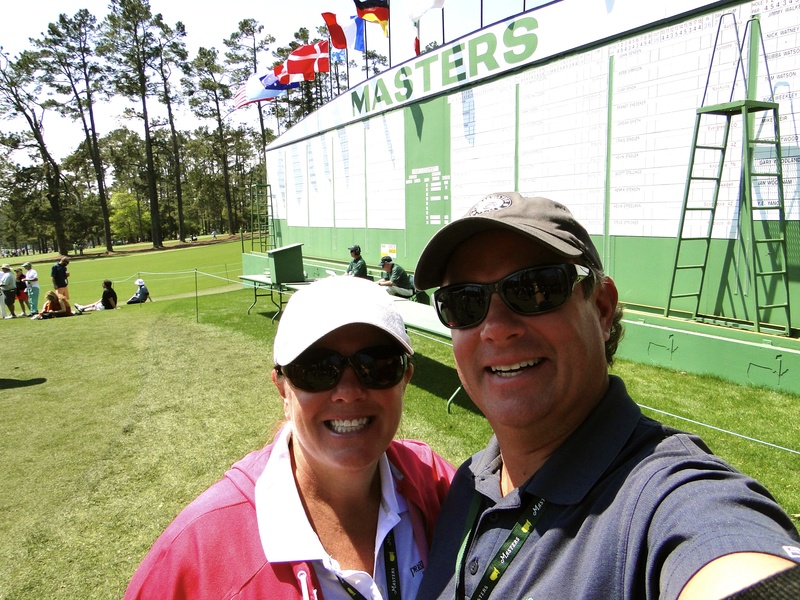 This entry was posted in April 2014 and tagged Augusta National, Bubba Watson, Bucket List, Georgia, golf, Masters on April 15, 2014 by Mike.